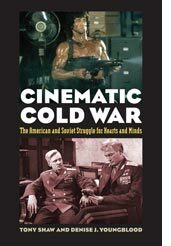 This cultural history compares and contrasts feature films from the US and the USSR produced between 1945 and 1990—the official years of the Cold War—an innovative form of film coupling that borrows from both the mathematical and musical uses of this theoretical trope, allowing for a dialectical reading of the selected films to emerge. While the authors’ unexpected juxtaposition of Roman Holiday (William Wyler 1953) and Spring on Zarechnaya Street (Marlen Khustiev and Feliks Mironer 1956) in order to identify the beginning of the period of the development of soft propaganda (1953-1978) may initially upset the reader’s assumptions of what constitutes a Cold War film, such an unorthodox coupling allows for a deeper understanding of how visual and ideological representations can be combined to shift cinematic, cultural and diplomatic consensus (p.i). This trope is consistently effective throughout the book in highlighting critical shifts in public opinion and governmental action in both the US and the USSR in five critical phases of the Cold War that Shaw and Youngblood identify both chronologically and ideologically: 1946-1953 are the years of hard line propaganda; 1953-1978 are the years of soft or flexible propaganda; 1978-1986 see a return to the hard line propaganda as both the Carter and Reagan administrations in the US once again seek a more concretely identifiable enemy in the USSR in order to justify shifting economic and foreign relations policies with both the Middle East and Latin America. ; 1986-1988 are the beginning years of glasnost sparked by Gorbachev’s Soviet leadership; 1988-1990 are the years of complete cinematic glasnost, or openness that see a proliferation of films from both sides filling domestic and foreign screens. The authors’ strengths throughout the book lie in their analyses of the diplomatic, political and institutional histories, which inform the films’ histories and aesthetics. In perhaps yet another nod to a carefully chosen stylistic trope, in each chapter where two films are compared, the chapter’s exposition and general description of the films under study tends to create a great deal of tension through a protracted description of the films’ plot and story, before revealing the larger institutional framework that makes these films such compelling sites of textual contestation and representation through which to understand the political and ideological tightropes that linked the US and the USSR for 55 years. For instance, Chapter Three’s discussion of director Elia Kazan’s 1953 apology film Man on a Tightrope, leads the reader to the edge of their seat, wondering if the authors will dispense with a retelling of the minutiae of the film’s production history in order to address Kazan’s status as a traitor in Hollywood, and how the climate of fear of Communism (with a Capital “C”) was exploited by the government and the media at all levels of US society in the immediate postwar era. Of course, this story is finally told in this chapter, and it is told in a way that allows for an effective discussion of the importance of place (geographically, economically, strategically and in terms of a film’s shooting location and the story’s setting) between this film and the Soviet counterpart example Meeting on the Elbe (Grigori Aleksandrov, 1949). The authors’ grasp of the actual history evidenced in a thorough knowledge and use of primary source archival materials is exceptional. It is unfortunate, however, to see the strength of these analyses watered down by a less than sophisticated discussion of the deeper aesthetic and formal trends in international cinemas of the eras under study. The dismissal or oversimplified use of such genre specific terms as Neorealism, Socialist Realism and documentary that themselves carry with them great historical and ideological genealogies cannot be overlooked in a study that focuses primarily on the cinema to make a larger claim about the production of Cold War consensus between the US and the USSR. Shaw and Youngblood’s final argument that locates a cultural détente that matches the actual Cold War détente of the 1970s as the beginning of a new political, economic and ideological alliance between the US and the USSR against both named and unnamed terrorists within and without is compelling. It is indeed where we find the US and Russia in 2011, once again as unlikely a pair of allies as the two nations were in WWII. However, the second part of this book’s focus on American and Soviet films that deal with representations of nuclear war, military institutions and guerilla warfare through more exceptional and effective couplings of films such as Nine Days in One Year (Mikhail Romm1961), Fail Safe (Sidney Lumet, 1964), and Rambo: First Blood Part II (George P. Cosmatos, 1985) and how these later Cold War films also bleed into the post Cold War feature film productions that continue in this new paranoiac vein and that continue to fill theaters in both the US and Russia, such as the Russian blockbuster Countdown (Yevgeny Lavrentyev 2004) overlooks an entire genre of films being produced mainly and most importantly in the former Soviet bloc nations that are grappling with a deeply held nostalgia for the Cold War era. Films such as Goodbye Lenin (Wolfgang Becker, 2003), The Lives of Others (Florian Henckel-Donnersmarck, 2006) and most recently, Farewell (Christian Carion, 2009) come to mind. Recognition of the production and success of these films internationally would in fact bolster Shaw and Youngblood’s argument about who in fact won this ideological war. Sadly, in the final analysis it is not only box office numbers that favor the US, but these beautifully constructed elegies being produced by individuals and countries still coming to terms with the cultural, physical, economic and ideological traumas that a bloodless war can create. For this reviewer, this is yet one more victory that I reluctantly cede to the US. This phrase is from a 1989 song by the British pop band The Eurythmics titled “ The King and Queen of America,” which directly addresses the end of the Cold War contest between East and West in yet another form of mass produced popular culture.